I’ve found my new favorite iPod game, and it’s called Phase. It’s the first game for the iPod created by Harmonix, the same company that graced the world with the Guitar Hero franchise. And Phase shares more than a casual resemblance to Guitar Hero—or other music games Harmonix has made in the past like Amplitude and FreQuency. If you’ve played any of Harmonix’s music games, you’ll have an approximate idea of what to expect. It’s basically a rhythm-matching game—an updated version of the classic game Simon, in which you have to match a series of cascading notes by tapping out in time on your iPod’s Click Wheel. Three positions on the Click Wheel correspond to three targets on the screen. Notes, appearing as lit circles, descend from three parallel lines connected to the targets, and you need to press the corresponding positions on the Click Wheel precisely as those lit circles pass over the targets. Occasionally you’ll see flowing “sweeps” that require you to slide your finger across the Click Wheel. Catching a lot of notes maxes out your streak “multiplier,” enhancing your score. You also have a chance to boost your score by capturing all parts of sweeps and specially-colored bonus phrases. You’ll earn stars along the way—catch enough, and you’ll make it through a checkpoint. But if you fail to catch the required amount by the time you reach the checkpoint, you’ll lose a heart. Lose enough hearts, and the game is over. iPod Hero : If you’ve played Guitar Hero, you’ll be familiar with the conceit behind Phase, a rhythm-matching game in which you match the notes scrolling by on your screen by tapping an appropriate locale on your iPod’s Click Wheel. While Phase includes a small library of music, what makes this game truly fun is the fact that you can create and use your own playlist. In fact, the first time you install the game, it will create a “Phase Music” playlist in iTunes that you can synchronize with whatever songs you like—stuff you’ve ripped from CD, stuff you’ve bought from the iTunes Store, or iPod-compatible music you’ve bought from other stores. Phase turns them all into gameplay levels. The game also features a number of ambient environments as backdrops for the game play—everything from urban cityscapes to psychedelic fantasias rife with bug-eyed monsters. It’s really trippy and delightfully fun—whimsical, colorful, and eye-catching. But what makes Phase so much fun is that it’s going to be different for everyone. Some people might want some pounding electronica or rock-and-roll to get their hearts racing; others might find some mellow jazz or instrumental music to be more conducive to the trance-like state you need to achieve to find your zen moment in Phase. 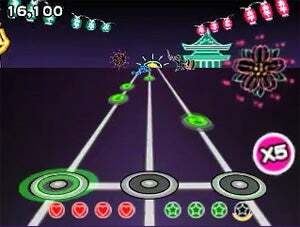 The game features two different modes: Quick Spin lets you play one song at a time, while Marathon lets you play multiple songs at increasing levels of difficulty. Phase is rife with options, too; you can shuffle songs, for example, manage different player profiles, and even “Choose Journey,” which lets you play a specific gameplay environment or randomize the choice. Other options let you pause, view high scores, get help, set volume, and exit the game all together. I tested Phase on a fifth-generation iPod. However, the game is also compatible with the third-generation iPod nano and the iPod classic. Phase is exactly what iPod gaming should be about—rather than reinventing the iPod as an also-ran game system, making it a truly unique game experience. If you’re a fan of Guitar Hero or similar music games, you absolutely need Phase on your iPod.